Having established what is driving you to do this passion of ours Chapter 3 of The Crystal System Book will help you get some clarity on exactly what it is you want and how you are going to get it. 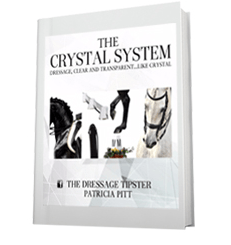 Moving onto Chapter 4 establishing your fitness levels and thereby your ability to ride dressage from several perspectives is fascinating and enlightening. people tend to smile at me when I tell them that I have a clearly defined set of goal for every year – they think I am way over the top. To me, goals are essential – the give me direction and as you said, ticking off goals makes you SEE achievements!